Contributor Martha Mintz was recently honored by the American Agricultural Editors Association for her story in the Fall 2016 issue of Homestead magazine, “Celebrating Sauerkraut.” Martha’s award-winning piece offers a poignant profile of mother-daughter sauerkraut masters, Phyllis Griffin and Nicole Rolf. Just in case you missed it, we’re once again featuring Martha’s story here…enjoy! Three giant freshly picked cabbages, some dill and an assortment of measuring cups sit expectantly on the island counter of Phyllis Griffin’s rural southeastern Montana kitchen, hinting at the day’s task. The white-green leaves are so crisp they pop and break when Griffin’s granddaughter, Nicole Rolf, grasps them to weigh. As they have so many times before, Phyllis and Nicole are preparing to make a family favorite, homemade sauerkraut. Avid gardeners, the pair are no strangers to food preservation. Like many of their gardening peers, they tackle the usual suspects such as pickles, tomatoes, salsa and pickled beets, but sauerkraut is a unique adventure all its own. From the antique tools—each with their own story—to sharing living space with a fermenting vegetable concoction for two weeks, it’s definitely an act of love. An act well worth it, in their opinion. The two notorious cooks spend a while talking recipes before turning back to the task at hand, one 86-year-old Phyllis remembers doing with her mother as a girl when the garden and food preservation was more about survival than enjoyment. An antique Kraut Cutter makes shredding cabbage a relative breeze as compared to using a knife. Cutting up. 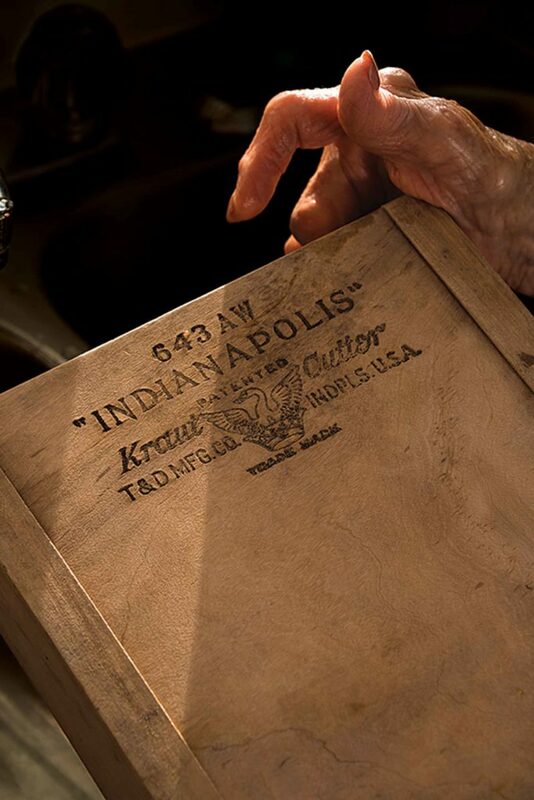 Phyllis grabs a well-worn carving knife in hands that remain remarkably competent despite bearing the signs of her 56-year battle with rheumatoid arthritis. Decades old, the knife is probably the newest tool they’ll use. Phyllis and Nicole take turns splitting the cabbages into quarters and removing the cores. Large and dense, it takes a good bit of strength and determination to break down the brassicas. 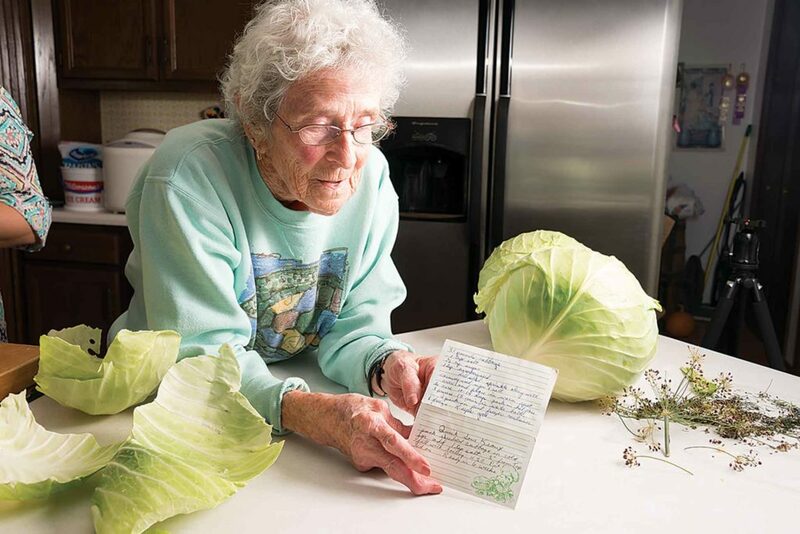 Phyllis reminisces that when she made sauerkraut with her mother they shredded the whole head using knives. “Now, with the Kraut Cutter it’s fun! You can have a crock full of sauerkraut in not too long at all,” she says. This modern wonder tool is a wooden board with three angled steel blades. A small box with a hinged top and open bottom are used to protect fingers as it shuttles the cabbage over the blades, efficiently shredding it. Most people are likely to have seen a Kraut Cutter in some kitschy restaurant on display with other relics of years gone by. Nicole and Phyllis work together to steady the board over the disinfected kitchen sink and start shredding. True to Phyllis’ word, the Kraut Cutter makes short work of the big hunks of cabbage. Soon little ribbons have been made of the densely packed heads and they’re overflowing the pan and sink. After weighing back the cabbage cores, it’s determined three heads will bring them to the precise 20 pounds of shredded cabbage they need. After the leaves comes a solid 4-inch layer of shredded cabbage sprinkled with salt, pepper, caraway and dill seed for this particular recipe. Nicole crouches next to the crock with her great grandmother’s potato masher in hand. Unlike modern mashers, this utensil is a solid generally bell-shaped hunk of wood on a handle. “It certainly never made fluffy mashed potatoes,” Phyllis recalled, but it makes great sauerkraut. Nicole takes the masher and starts pounding the cabbage. As she pounds, the cabbage releases water until eventually there is a layer of juice covering the surface, splattering with each drop of the masher. They add another layer and repeat the process. “We’ve always loved to help grandma make sauerkraut, especially with the pounding part,” Nicole laughs as she thumps away on the kitchen floor. Phyllis Griffin shows off her prized recipe. Layers of goodness. They keep adding layers of cabbage and ingredients until they’ve gone through their 20 pounds. Once there’s a good layer of juice protecting the final layer of cabbage, Phyllis puts down another layer of leaves, positions a plate on top and a gallon jar of water on top of that. “You need to weight it so the juice stays over the cabbage,” she explains. A dish towel is used to cover the crock and it’s left to repose on the kitchen counter, waiting for the bacteria to process cabbage into sauerkraut. “It will need to ferment at least 14 days in a warm place. It takes longer if it’s too cool. You can definitely smell it when it’s done,” she warns. When fermentation is complete, they’ll freeze or jar and hot water bath the sauerkraut, preserving it for many family dinners down to come. It’s not only cabbage they preserved this day, though. The work is accompanied by reminiscing, the sort that keeps family stories a living record for generations to come. Over the course of the day Phyllis shared anecdotes ranging from how her father proposed to her mother via telegraph to misadventures in goose defeathering using steam to how much fun her grandchildren had making up plays in her basement and then charging admission to the family. Sauerkraut and other fermented food have been making a comeback with modern gardeners and food preservation enthusiasts. Colorado State University even developed a new Fermentation Science and Technology major in 2013 in response to the growing interest. The movement is partially fueled by the fact fermented foods, including fresh sauerkraut, come with beneficial bacteria that serve as probiotics which have been shown to have great health benefits. While many are just jumping on the sauerkraut bandwagon, for Phyllis and Nicole it’s tradition, it’s fun and it’s just darn good eating. Just a month after this day of story sharing and sauerkraut making, Phyllis passed unexpectedly at 86 years old. Her stories, traditions—both in the kitchen and out—and recipes will carry on with her children, grandchildren and great grandchildren.